Please welcome A.F.E. 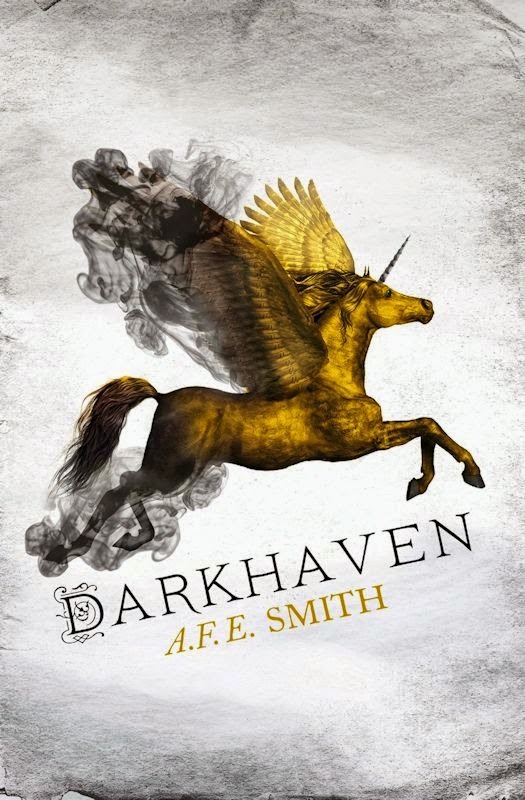 Smith to The Qwillery as part of the 2015 Debut Author Challenge Interviews and the Darkhaven Blog Tour. Darkhaven is published on July 2nd by Harper Voyager (UK). You may read a Guest Blog by A.F.E.Smith - City as character: building Arkannen - here. AFES: I’ve always been a writer. I wrote my first book when I was six (it was about a super-powered rabbit). Because it was that long ago, it’s hard to remember why. I think writing always just seemed like the natural consequence of reading. I was a voracious reader from a very early age and when I didn’t have any new stories to hand I would make up my own. I vividly remember creeping down from my bunk bed when I should have been asleep, to write down a story idea I’d just had. I must have been about seven or eight. And my life has pretty much gone on like that ever since, except these days I don’t sleep in a bunk bed. AFES: When I started writing, I was a total pantser. I’d just write and see what happened. 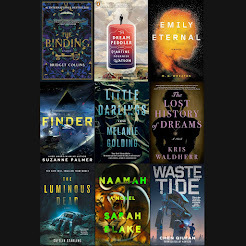 And sometimes I’d end up making really cool connections with other things I’d already written, and everything would come together organically. But sometimes it wouldn’t. It was a fun way of doing things, but slow and not always productive. These days, I don’t have time to completely pants it. Which might sound strange, because plotting takes more time up front than pantsing. But it works out quicker in the long run, because I don’t wind up going down too many dead ends. Having said that, my plotting is only ever outline plotting – chapter by chapter. It’s a basic framework upon which the characters clamber around and do their own thing. So there’s still quite a large element of pantsing. They seem to prefer it that way. As for the most challenging thing about writing … it sounds clichéd, but at the moment, it really is finding the time to do it. I have a full-time job, a three-year-old son and a baby daughter. Writing has to squeeze in around the edges. TQ: Your bio states that you work as an editor. How does that affect your own writing? AFES: In good and bad ways. It means I provide pretty clean copy to the publisher (though, of course, even at the copyediting level, no two editors will ever make exactly the same changes). And I’ve had a lot of practice at revising and refining text, from the top level right down to individual words and sentences. But at the same time, it also means I’m forever tempted to revise as I go along – and that spoils the flow. I’ve had to train myself to simply keep writing in a first draft and not polish as I go along. Because if you polish details too early, that extra investment of time and effort means it becomes harder to change them for the sake of the big picture. 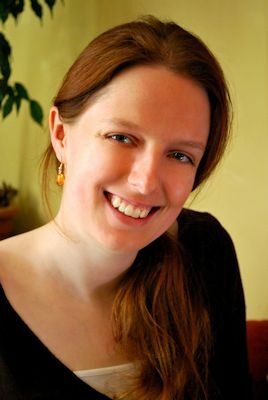 AFES: I hesitate to claim that my writing is influenced by anyone, lest I appear to be comparing myself to them, but my favourite authors – those whose talent I would aspire to – are Diana Wynne Jones, Robin Hobb, Jacqueline Carey, Juliet Marillier, Patrick Ness and Ursula Le Guin. I don’t think I write like any of them, though. Maybe one day. TQ: Describe Darkhaven in 140 characters or less. 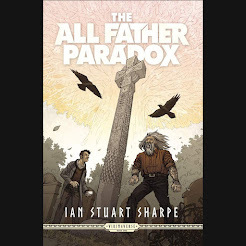 AFES: Shapeshifter accused of father’s murder fights to clear her name. Love, obsession, swordfights & a unique city all combine in a twisty plot. TQ: Please tell us something about Darkhaven that we won’t find in the book description. AFES: Book descriptions tend to focus on one or maybe two main characters, but in fact Darkhaven has seven point-of-view characters. It’s really more of an ensemble piece. TQ: What inspired you to write Darkhaven? What appealed to you about writing a genre bending “fantasy whodunit”? AFES: Inspiration is a funny thing. It comes from many different places and although I might point to one idea or experience as the starting point for a novel, I could give a handful of other answers that would be equally true. 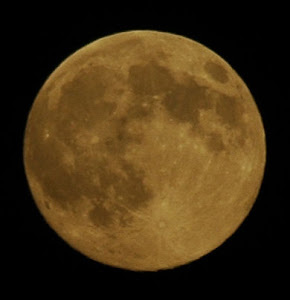 I think really it’s the synthesis, the coming together of ideas and external influences, that is the real inspiration. It’s as much about serendipity as it is about anything else. Still, I usually say it was the opening scene that came to me first and inspired me to write the rest, and that’s as true as anything. As for genre bending, I think one of the nice things about fantasy is that it combines easily with any other genre. So you can have fantasy crime novels. You can have fantasy romances. You can have historical fantasy and action adventure fantasy and … I dunno, sports fantasy. Is that a thing? It should be a thing. Anyway, I didn’t set out to bend genre as such; I just wrote the story I wanted to tell. Along with speculative fiction, I’ve always enjoyed the classic crime writers like Agatha Christie and Dorothy L. Sayers, so I guess murder is in my blood as much as magic. Though I wouldn’t say Darkhaven is a traditional whodunit, much as it isn’t a traditional fantasy. TQ: What sort of research did you do for Darkhaven? When and where is the novel set? Where can we find out more about the city of Arkannen? AFES: Darkhaven is set in a completely different world, so ‘when’ is hard to identify. However, the entire novel takes place within an industrialised city (Arkannen) that I see as being approximately equivalent to eighteenth-century England in terms of technology, but with more steam power. (Darkhaven isn’t steampunk, but it has a steampunkish flavour.) So there are gas lamps, airships, factories, trams, clockwork. Lots of bladed weapons, but firearms are beginning to creep in too. Research-wise, I had to know what sort of technologies had been around in the eighteenth century so I could give the book that kind of background consistency where the details just seem right to readers. Because even though it’s a fantasy world, people come to it with certain expectations and so it’s worthwhile making the unimportant details similar to our own industrial history. That frees up their suspension of disbelief for the big, important differences, like people who can change into flying unicorns. There were also a few things I had to research in more detail. I know far more than I want to know about traditional leather-making. You can find out a bit more about Arkannen on my website – though I should warn you, the page is rather a work in progress. There’s a rudimentary map, though. Maps are always good. TQ: Who was the easiest character to write and why? The hardest and why? Did any of the characters surprise you? AFES: The easiest was probably Tomas Caraway, my failed Helmsman (bodyguard to the royal family) – because if I’m allowed to have a favourite character, he’s probably the one. There’s just something satisfying about writing the kind of personal redemption arc he goes through. The hardest … Owen Travers, Captain of the Helm, who is in pursuit of Ayla to lock her up for her father’s murder. He does some awful things, but he’s not capital-e Evil. Very few people are. So although I don’t want readers to like him, I do want them to understand him a bit. It was rather like arguing passionately for a position I don’t believe in. And yes, my characters surprise me all the time, because they insist on going their own way despite my attempts to prevent them. A bit like my children, really. TQ: Which question about Darkhaven do you wish someone would ask? Ask it and answer it! TQ: Give us one or two of your favorite non-spoilery lines from Darkhaven. AFES: Oh, I find this very difficult! Hmmm … OK. Here’s a little snippet of conversation between Myrren, the elder of the two Nightshade siblings, and Serenna, the priestess who is helping him investigate his shapeshifter father’s murder. ‘Tell me about him,’ Serenna said softly. ‘I meant as a person,’ she chided him, though she was smiling. Myrren lifted a shoulder. How could he explain that to him, his father was his Firedrake self? That Myrren’s personal acquaintance with those talons had made it hard to see beyond them? I guess I like this because it seems light-hearted to begin with, but it turns out to be dark underneath. Which is fairly typical of everything I write, for some reason. AFES: My second book, Goldenfire, is currently with the publisher. It picks up with some of the characters from Darkhaven a few years down the line, only they’re dealing with an assassination plot rather than a murder this time. And a third book is due to follow six months after that. AFES: Thank you for having me! Great interview~thank you for sharing!